Temperatures are warming up and flowers are blooming, it’s time to do a little spring cleaning. 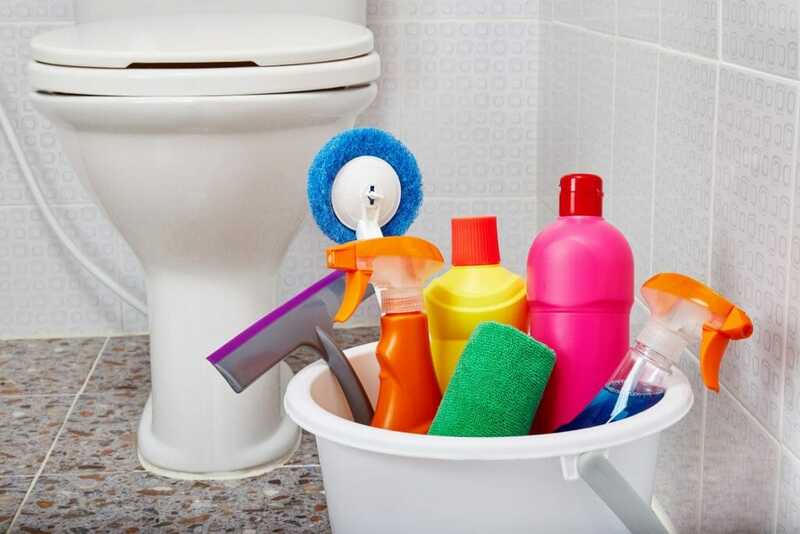 Rinsing porches and cleaning behind furniture is a good start, but what about your bathrooms? How can you get them ready for the warmer and brighter weather coming your way? In this article, I will share some tips with you for sprucing up your bathroom just in time for spring. How deeply should I clean my bathroom? When doing a deep clean of your bathroom, expect to get in every nook and cranny. Faucets, drains, grout, baseboards, all of it could use a clean every once in a while. Begin by collecting all the supplies you’ll need: bleach, soap scum cleaner, multi-purpose cleaner, rags, old toothbrushes, baking soda, vinegar, glass cleaner, toilet bowl cleaner, a toilet bowl brush, a broom and dustpan, a mop, a trash bag, and last but not least, rubber gloves. I have everything I need, now where do I start? Begin by emptying the trash can in your bathroom, and then start to go through drawers and cabinets. Take one thing at a time, starting with one drawer. Throw away expired medicine, old makeup, stray Q-tips, and anything of the like. If you haven’t used it in a while and don’t see yourself using it soon, go ahead and toss it. Freeing up space will help you better organize the things you do use daily in your bathroom. Once you’ve thrown out as much as you can, remove everything else from the cabinets and drawers and set them out on the ground or in another room out of the way. Use multi-purpose cleaner to spray out all drawers and cabinets. Then, begin to put everything back while organizing by type (example: makeup goes with makeup, hair care goes with hair care, etc). This will make sure that all the items in the same category are in the same place, so you never again have to go digging through multiple drawers to find what you need. Now that the interiors of your bathroom drawers and cabinets are fresh and clean, let’s move on to some of the more nitty-gritty areas of your bathroom. There’s no doubt that your tubs and sinks get a lot of use and abuse. Between soap scum, hair clogs, toothpaste, and more, these parts of your bathroom will need a little tender love and care. Begin by pouring baking soda down all the drains in your bathroom. Follow it with vinegar to create a homemade drain cleaner that’s safer than the harsh chemicals found in many other products. The chemical reaction between the vinegar and baking soda will both dislodge any clogs that may be hanging around in your pipes, but will also begin to break down the items causing the clogs and will wash them down. For best results, cover the drains after pouring the vinegar so the entire solution stays in the pipes and doesn’t bubble out into your sink or tub. After 2 minutes, run hot water down the drains to further clear any blockages. Now that you have clear drains, you can begin working on the tub, sinks, and faucets themselves. 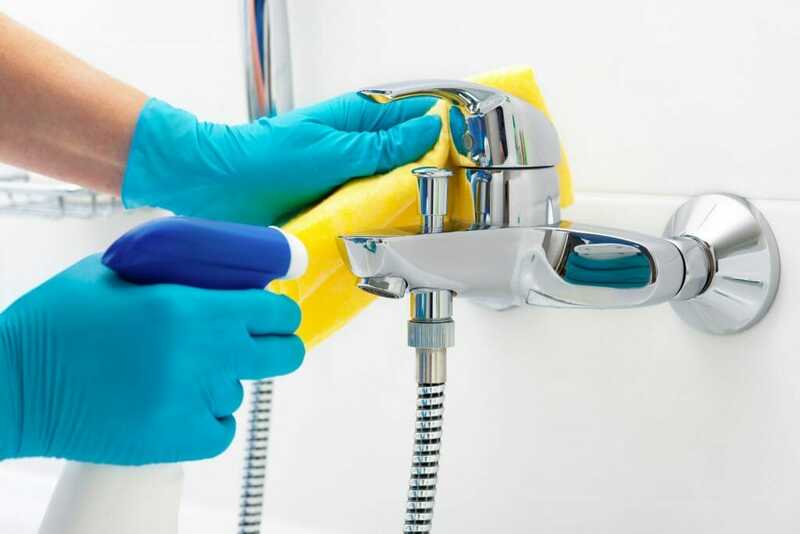 It would be best to put on your rubber gloves now to protect your hands from the chemicals in your cleaning products. Start by spraying soap scum cleaner all around your tub and/or shower, as well as on any of the faucets. Let it sit for approximately 30 seconds, then wet a rag with hot water and get to scrubbing! As you work, rinse the rag periodically to rid it of extra cleaning solution, soap scum, or dirt. When you come to the end of your scrubbing, rinse the entire tub/shower down with hot water, and wipe the faucets down with multi-purpose cleaner to rid them of any streaks caused by the soap scum cleaner. Countertops, luckily, are simple. Move everything out of your way and spray them down with multi-purpose cleaner, following this with a wipe from a clean rag. Done! Toilets, on the other hand, will take some work. Often, the toilet is the most dreaded thing to clean in a bathroom. But have no fear! You’re armed with rubber gloves, the right cleaning supplies, and the perfect amount of elbow grease to make your toilet gleam. Begin by cleaning the bowl: squirt a generous amount of toilet bowl cleaner around the inside rim and begin scrubbing with your toilet bowl brush. Don’t leave a single nook unscrubbed! When you’re done, flush the toilet and leave the seat up to begin cleaning the rest of the bowl. Use bleach and a fresh rag to wipe down both the seat and the rim underneath, paying close attention to the back of the seat where the lid attaches. Try to get in and around the hinges of the lid to get a fresh start for spring. Finally, wipe down the lower part of the toilet and the floor directly surrounding the toilet with bleach. Voila! A perfectly clean toilet! We’re coming to the end of our bathroom cleaning extravaganza! Only the floors, mirrors, and any windows remain. For windows and mirrors, simply spray with glass cleaner and wipe down with a rag or paper towel. Your floors, however, will need a little more elbow grease. Begin by sweeping up any dust or hair found on the floor. Then, if you have tile with grout in your bathroom, grab your bleach and an old toothbrush. Pour a little bleach on the floor and use the old toothbrush to scrub in between the tiles on your bathroom floor. This will help lift dirt from the grout while bleaching stains. This could take a while, so buckle down! Once the grout is to your liking, you can simply mop the floor with hot water and multi-purpose cleaner. And there you have it! A fresh and shining bathroom, ready for spring! Though the term is ‘spring cleaning,’ your bathroom can benefit from a deep clean 3-5 times a year. Bathrooms get heavy use, and deep cleaning more regularly can make the process go faster than waiting until each spring. I hope you’ve enjoyed these tips! If you’re considering remodeling your bathroom, take a look at our website or call us at 614-721-3883. Happy spring, everyone!